Another stadium of over 100,000 capacity after Maracana is awaiting a significant downsize. Now it’s time for Yuba Bharati Krirangan in Kolkata. After conversion to all-seater it will hold “only” 80,000 people. Prior to the current redevelopment, famous Maracana in Rio de Janeiro was over 107,000 in terms of capacity. This was enough to outgrow most stadiums, but not the one in Kolkata. Yuba Bharati Krirangan, or the Salt Lake Stadium, could already take 120,000 people or more. 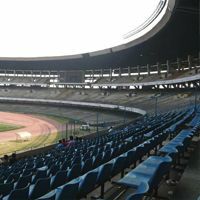 Today the Indian stadium remains world’s largest football ground, but its standard has been subject to severe criticism. And whilst it lacks basic facilities for fans, the stadium will improve only slightly with seats to be installed for 50 million rupiah (under $1 million). The change will come ahead of the 2017 U17 World Cup, which will see its final at this grand venue. The shift will see capacity fall by some 30%, stopping at 80,000 and becoming an all-seater first time in history. Although officially the capacity can be moderated for various events, it seems very unlikely to ever hold as many people, as the stadium now does for Kolkata football derby, with crowds of over 130,000 people being reported.